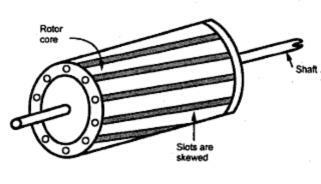 The rotor core is cylindrical and slotted on its periphery. The rotor consists of uninsulated copper or aluminium bars called rotor conductors. The bars are placed in the slots. These bars are permanently shorted at each end with the help of conducting copper ring called end ring. The bars are usually brazed to the end rings to provide good mechanical strength. The entire structure looks like a cage, forming a closed electrical circuit. So the rotor is called squirrel cage rotor. The construction is shown in the Fig. 1. As the bars are permanently shorted to each other through end ring, the entire rotor resistance is very very small. Hence this rotor is also called short circuited rotor. As rotor itself is short circuited, no external resistance can have any effect on the rotor resistance. Hence no external resistance can be introduced in the rotor circuit. So slip ring and brush assembly is not required for this rotor. Hence the construction of this rotor is very simple. Fan blades are generally provided at the ends of the rotor core. This circulates the air through the machine while operation, providing the necessary cooling. The air gap between stator and rotor is kept uniform and as small as possible. In this type of rotor, the slots are not arranged parallel to the shaft axis but are skewed as shown in the Fig. 2. A magnetic hum i.e. noise gets reduced due to skewing hence skewing makes the motor operation quiter. It makes the rotor operation smooth. The stator and rotor teeth may get magnetically locked. Such a tendency of magnetic locking gets reduced due to skewing. It increases the effective transformation ratio between stator and rotor.